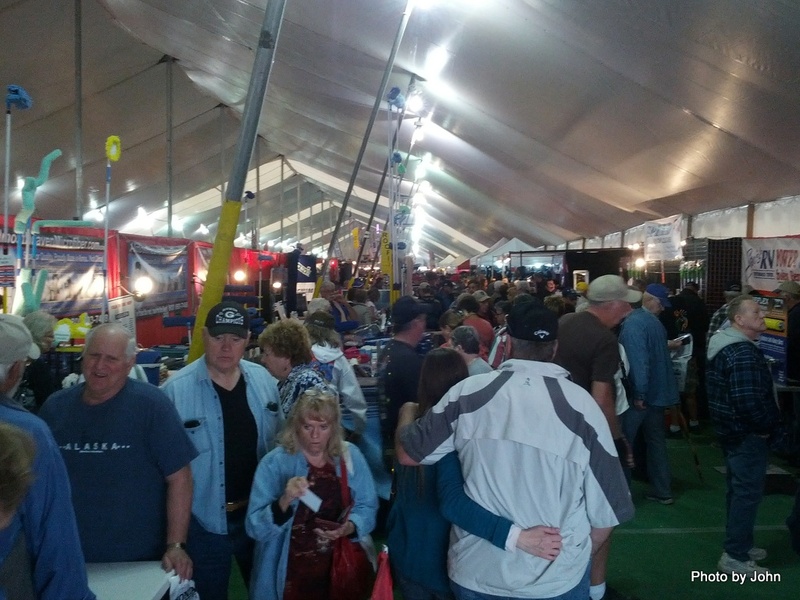 In addition to the typically nice winter weather and very inexpensive camping, Quartzsite is home to a very large annual RV show and multiple flea markets. The big tent houses about 300 booths with anything remotely interesting to RVers. This year LED replacement bulbs were highly popular. There were more displays around the outside of the big tent, less crowded because of the overcast and because it was nearing the end of the 10 day show. 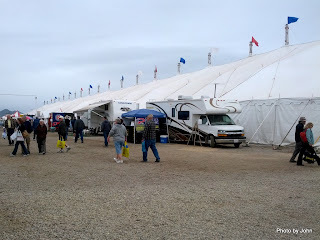 We didn't bother to even walk through the area filled with new and used RVs for those who thought something new would be better than what they currently had. Or egg crates in small or large sizes. But best of all, if you wanted to take the time, you could join the 5400 others who had passed the test for their concealed carry permit at one of the Quartzsite flea markets. Ivan's Roadtrip 2013 blog from January 26th includes a number of aerial views of Quartzsite shot during the show (Scroll down in his blog for the aerial views). Turk and BJ were able to join me for a couple days in between some of BJ's three consecutive weekends of required recurrent SAR training. Turk enjoys traveling with us and realizes that he runs the show. We went out for a walk the afternoon that they arrived, sticking to the obvious roadways since there are lots of cholla in the desert around here. Not long after we started, Turk came to a stop, and then carefully sat down, clearly not planning to move further. BJ picked him up and we discovered that in spite of staying on the road, he was now sporting a small cluster of cholla needles in a paw. He didn't fuss, just refused to go further, until we pulled the needles. He did the same the next day at the RV show in Quartzsite - too many human feet weren't watching for him and were making him uncomfortable. Clearly, the lesson is if you don't like it, sit down. After too short a visit, BJ and Turk headed home. Next time, we'll remember to bring his boots. They'll be back in a couple weeks. Meanwhile, I'm enjoying some beautiful boondocking and some welcome rain in the desert. 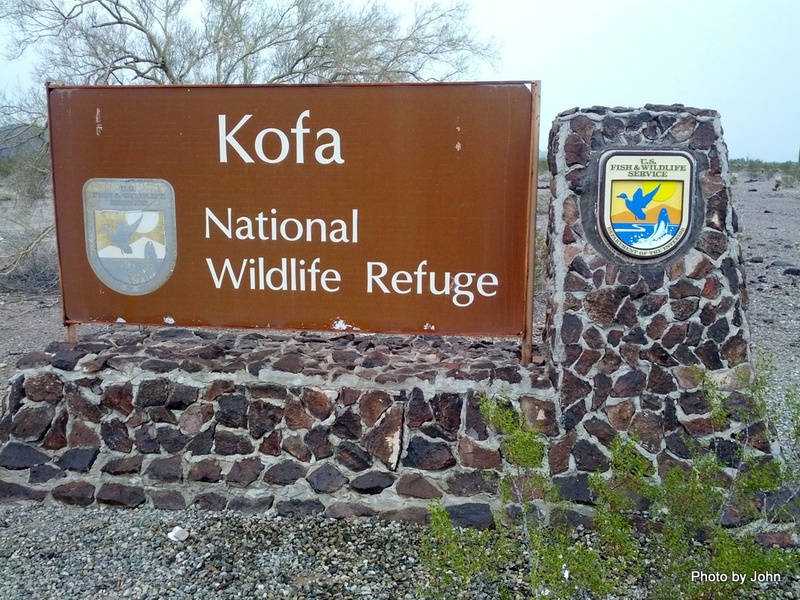 Named after the King of Arizona mine, the Kofa National Wildlife Refuge takes in about 1,000 square miles of mountains and desert between Yuma and Quartzsite, Arizona. About 80 percent of it is managed as wilderness and there are no prepared camping areas. While it's close to Quartzsite, it is a very different experience than the highly popular BLM camping areas there. Boondocking is allowed in the Refuge as long as you remain within 100 feet of designated roads and at least 1/4 mile from any water source. There are no paved roads in the Refuge. The Palm Canyon road leads to - surprise - Palm Canyon, and was well maintained when we visited. There were 5 RVs of various sorts scattered along the 7 mile plus road. We're staying for the better part of a week (14 days max per year) in the Crystal Hill area. The road was not as nice as the Palm Canyon road and was marked at the intersection with the highway as "no camping beyond this point" but that referred to BLM land. 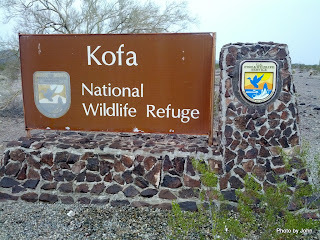 Once you cross the Kofa NWR border 3 miles from the highway, boondocking is an option. There are five units scattered within 1/2 mile of Crystal Hill and very little traffic. There are a number of wells in the Refuge that are equipped with windmills to provide improved water resources for the Desert Bighorn Sheep that live in the area. One of the other people camped in the area was clearly a solar advocate. In addition to the panels visible in this picture, there were 4 more panels on the street side of the motor home and some on the roof as well. 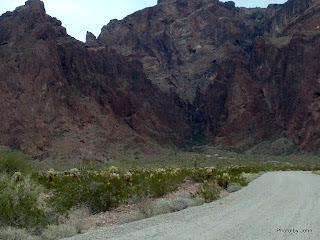 It's a very beautiful place, with minimal traffic and a view of the night lights in Quartzsite about 12 miles northwest. We had 24 hours of rain (very unusual) but the sun is out now. Zero bars of Verizon on the phone, but 3 (sometimes 4) bars with the antenna & amplifier. This location was mentioned in a blog about a year ago and caught my attention. It's a small pond that is stocked for fishing but is not well known and is a little challenging to find because of all the diversion dikes and dead-end dirt roads. The majority of the people here seem to be attracted by the fishing although I didn't see them catching much. With the exception of the immediate area, it is surrounded by farming - primarily green (and other color) leafy vegetables this time of year. The pond is on BLM land and has no services. There is a 14 day camping limit. I counted 17 different units when I walked around the pond, including one tent and one tent trailer. Over half of the units were lined up nose to tail in one section. I was able to select a spot that was more solitary, featuring reflections of fall colors. Daytime temp was about 75 and it got down to able 45 at night although it had been significantly colder the previous week. This one is going on my "wanna return here" list. One bar of Verizon bumped to five bars with the antenna and amplifier. Kathy, Willie, and I got an early start to avoid congestion at the ramp at Picacho as well as the ramp at Fisher's Landing. We benefited from some smooth water for a while as well. You do learn to step around the burro droppings, especially if they're fresh! While Kathy and I paddled along near the grass on the edge, watching the coots duck into the bushes, Willie picked a line closer to the center where he could more easily notice signs of the mining history in the area. We stopped in at one of the "lakes" on river left about river mile 59 or so since the access point was more open than sometimes. The grass forms a tunnel as we return to the river. Further down the river we met the Yuma River Tours jetboat coming up stream but he selected the other side of the river for his route. But the picture isn't about the boat, it's about the bald eagle on the sandbar between us and the jetboat. When others in the group came along, the eagle had a fish. Folks on the trip also saw osprey and peregrine. At the take-out, we were able to get our boats and gear loaded before others starting arriving and even had an opportunity to confirm the quality of the hamburgers at Fisher's Landing. A big thanks to Helen Howard at Desert River Outfitters for her friendship and for organizing the considerable shuttle logistics that makes this trip viable. Day 2 is a shorter day just because of where legal camp spots are located. With just 7.5 miles, the sun was higher on the hills when we got out of bed for the final time. In spite of dutch ovens full of cinnamon rolls, I stuck to my planned breakfast meal with minimal mooching. We got to paddle with Dr. Z and his beautiful handmade hybrid Cirrus today. The open boats were starting to look like garbage scows today with all the trash from the "banquet" last night. The back country sites, although they do have four wheel drive access, don't have garbage service but our destination for today does! Camp for the evening was one of the group sites at the main part of Picacho State Recreation Area. I never was able to get a picture with all of the tents visible! Picacho was originally a small mining town and some remains are still accessible via a short hike. It also sports solar hot water for showers in the campground for those who want to be pampered. The park is accessed via an 18 mile gravel road which serves to limit the impact on the hot water system. I made what I declared to be Shepard's Pie although there was some discussion regarding the liklihood of said shepards recognizing it. It was declared good and really good and I didn't get a picture of it so I'll declare it good enough. Meanwhile, there was another group making clay-baked salmon while most enjoyed turkey soup and/or chili. And you thought this was a wilderness starvation trip! For the fifth year in a row, Helen has invited her friends to join her on a 35 mile, 3 day trip on the Lower Colorado River from Walter's Camp to Fisher's Landing. Since the river in this section is the dividing line between Pacific and Mountain time, I was not sure if I was up early or the others were late, missing the sunrise. This was the first trip for the wonderful tent that my co-workers gave me as a retirement gift. So much nicer than the proverbial watch! There were about 30 people on the trip, by far the largest group yet. This is just part of the group loading their boats for the first day. Everyone was fully loaded with charcoal, dutch ovens, food, wood, etc since the trip has morphed into a gastronomical delight over time. The river through this section, while impounded by the Imperial Dam, has a very natural appearance unlike the section immediately above this one where all that can be seen from the river are dikes of large rock. We were blessed with tailwinds the majority of the time and daytime temps in the mid-70s. Shortly after entering the main channel (Walter's Camp is on an abandoned meander) we entered the Imperial Wildlife Refuge. For most of the remainer of the trip we would be in Wildlife Refuge or Picacho State Recreation Area where it was legal to camp in designated locations. Since Kathy, Willy, and I were running ahead of the group and access to the trail was clear, we stopped in to visit the smokehouse that is about all that remains of the Draper Ranch. Because of the size of the group, two trash can turkeys were hidden under their respective trash cans in preparation for dinner. There aren't any pictures of the turkeys when the can was removed because they both fell apart. In addition to the turkeys, there were 15 packages of veggies roasted and 7 dutch ovens that were cooking up other wonderful stuff including multiple desserts. Gluttony was the order of the day. Days 2 & 3 will follow at some point soon. It's finally time to hit the road, getting the canoe wet and testing out the mods that I installed during the past few months. 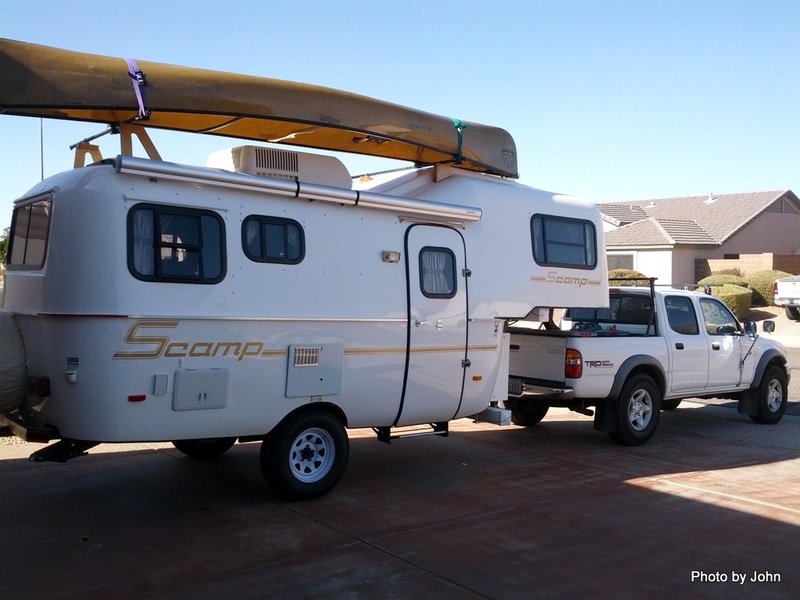 The Scamp is provisioned and the canoe is loaded. 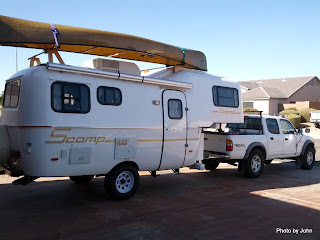 Looking forward to two short river trips, one near Yuma and one below Hoover Dam, interspersed with visits to three boondocking locations and then finishing off with nearly a week west of Quartzsite at a fiberglass trailer gathering. Going to be fun checking out new places and meeting people with similar interests. Southwest Rocks – Not a Geology Lesson! 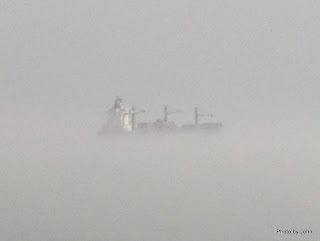 We were scheduled to arrive in Galveston between 6 & 7 a.m. but the engines went silent about 3 a.m. – not a good sign. 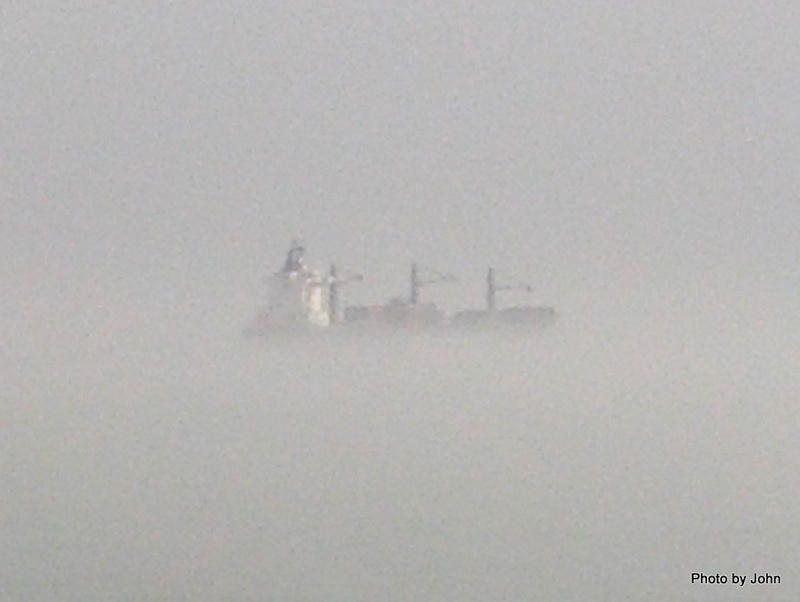 Morning light had an eerie glow through the fog eventually followed by an announcement that the port is closed due to fog. We’re told we should be disembarking by noon – pretty tight but our flight doesn’t leave until 2 p.m. so there’s a chance… except they didn’t lift anchor from our 3 a.m. location until nearly 1 p.m. Minimal communication was the general theme but Disney did contact the airlines and let them know we’d be late. Cabin staff was under pressure to clean and prep the cabins for the people scheduled to board in Galveston. We finally got off the boat after 3 p.m., released in one big push rather than by smaller, orderly groups as they normally do. Locating luggage took some time. The information had been that our luggage would be grouped together (depends on your definition of "together") so it was a bit of a scavenger hunt, especially for Kelli’s black - looks like everyone else’s - bag. Customs and immigration moved as quickly as could be expected and we were loaded on our shuttle bus to the airport shortly after 4 pm, but the bus broke down less than a mile from the Galveston terminal, requiring an eventual bus change. We finally arrived at the airport about 6 p.m, over an hour after the last Phoenix flight. Since we were one of three cruise ships that were held up by fog, seats on every flight to anywhere were disappearing fast. The title may get me in trouble with our son who flys for a different airline, but it's true. The staff at Southwest (where you still don’t pay for the first two bags) were wonderful! Our tickets were changed to a connecting flight at 4 p.m. the following day with excellent boarding positions. To top it off, they gave us a voucher for a $51 rate for the overnight at the local DoubleTree, complete with warm cookies. Couldn't ask for better! We had a great time with family! Disney did a wonderful job with "presentation." They have wonderful programs for kids between ages 3 & 18. They put a lot of emphasis on staff getting "excellent" ratings on their survey and the staff in direct contact with passengers puts a lot of effort into their work. Unfortunately, we’ve proven that pixie dust doesn’t trump fog and that smoke and mirrors are just that. Once they have to deviate from the script it becomes clear that many of the staff aren't able to respond effectively. Throughout the trip I noted issues that I found surprising - nothing major, but not to the level they would lead you to expect. Meanwhile, Southwest came through big time. What Happened to Costa Maya? Maybe it was lost like the Mayan civilization. We’d hoped to visit some Mayan ruins, but the weather said otherwise. The Captain told us we couldn't dock because of high swells that are forecast to get worse, washing over the top of the dock. Instead, we headed on to Cozumel where we’d be docked for nearly 20 hours instead of the scheduled 10 or 12, giving us a chance to go to dinner as a family at Casa Denis. While the son & daughter-in-law went diving, we enjoyed a shore excursion that was prefaced by questions about our tolerance for dust, mud, wet, rough, and noisy. Right down our alley! 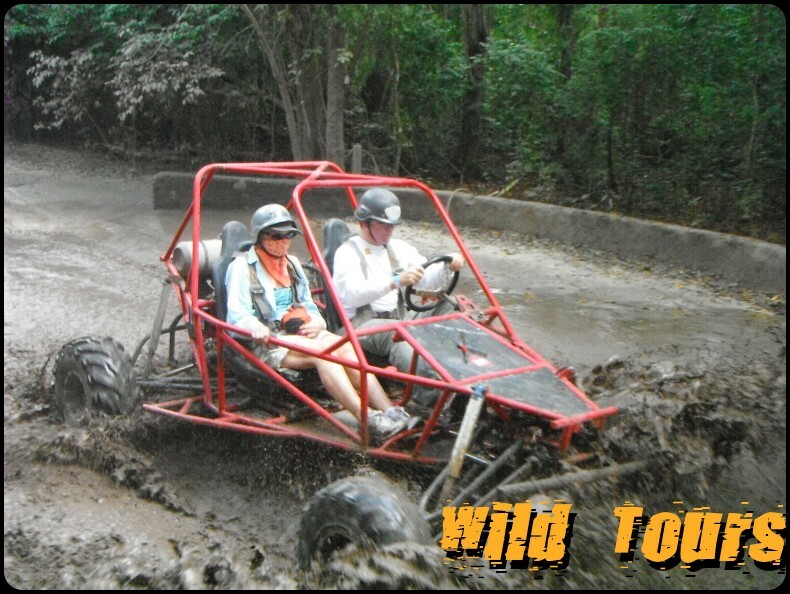 WildTours in Cozumel does several tours for the cruise trade. We selected Jade Caverns by XRail. The XRails are two person rigs and you must be 18 to drive. Kelli teamed up with Spencer while BJ rode with me. She was going to drive on the way back but decided it was too dusty for her contacts. Goggles were available and we would have been wise to take advantage of them! We toured a limestone cave that was reportedly used by the Mayan for shelter from storms, but the highlight was the Jade Cavern, a limestone cave filled with water. Many elected to go swimming. Spencer, and others, decided that swimming wasn’t enough so they took advantage of a trail that led to a spot where they could jump into the pool. It’s a fuzzy picture, but Spencer decided a forward somersault was in order. The video shot by the WildTours staff was much better. 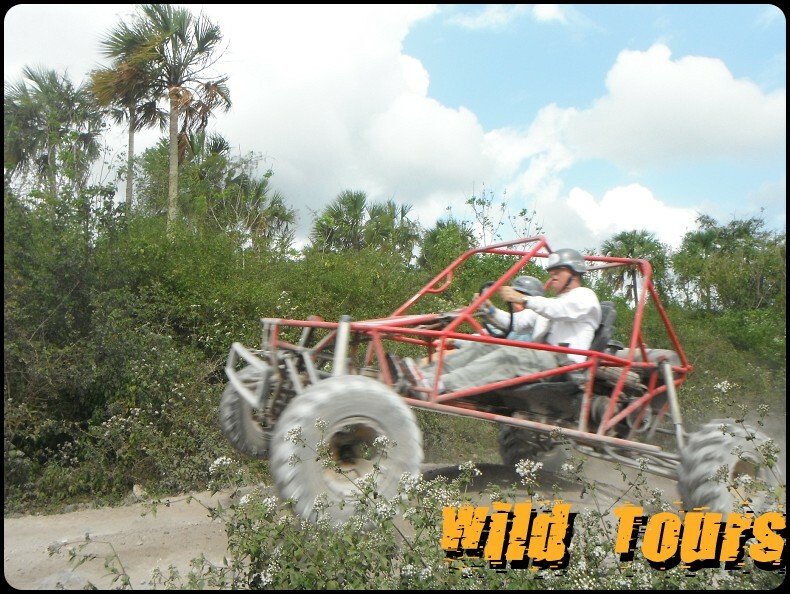 Spencer decided the excursion wasn’t good – it was awesome! We all enjoyed it and were very impressed with the staff of WildTours. Lots of fun!